Awe, Man! I so bad want to drive to my freshman daughter’s college campus to celebrate her Birthday with her. This will be the first Birthday I haven’t been able to celebrate with her in person. Ugh! I’m hoping this Birthday Party In A Box will bring her and her friends joy and a little reprieve from the academic rigor of college life! 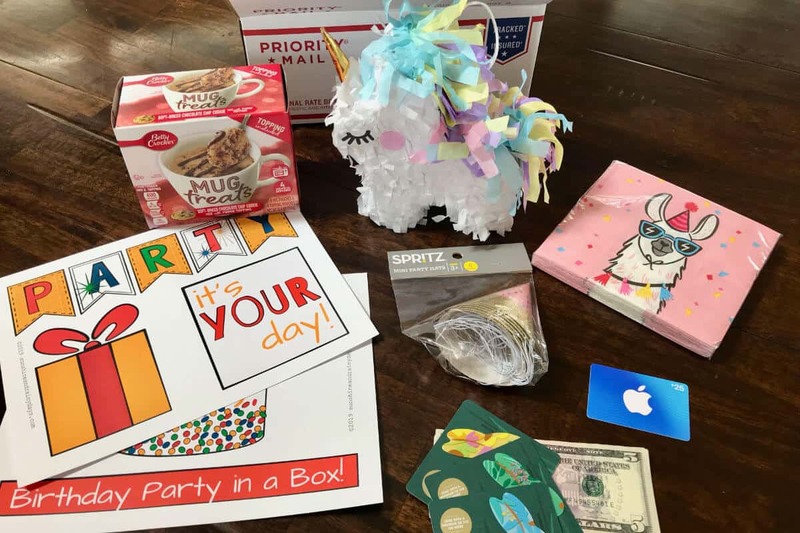 Whether you have a college student, friend, or family member away from home, the Birthday Party In A Box is a sure way to bring you closer on their special day! 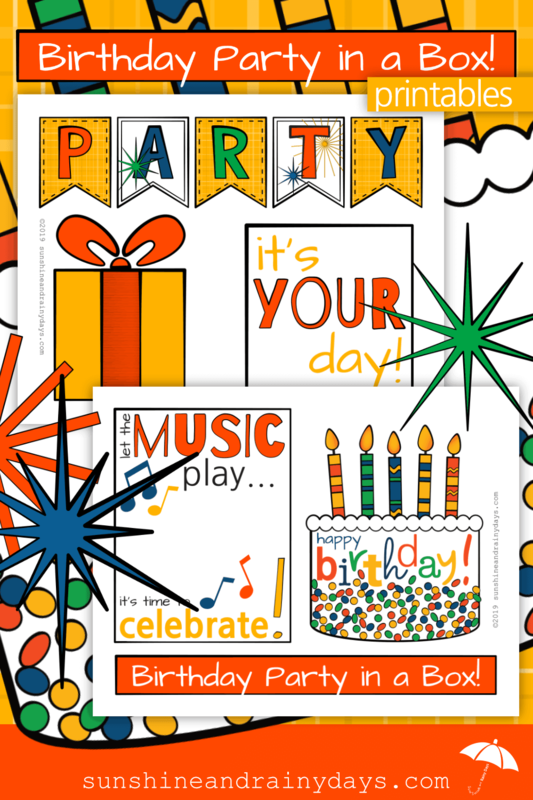 Print the Birthday Party In A Box Printables – found below, on card stock. Cut the shapes using a paper cutter and scissors. Use a 1/8″ hole punch and punch two holes at the top of each PARTY Flag for the PARTY Banner. Use jute to thread through the holes, leaving a generous tail at each end (in case your college student wants to hang the banner for decoration). Adhere the Box Decor to the inside flaps of your Birthday Party In A Box using an adhesive applicator. I chose to create a Birthday Box to be shared with my daughter’s friends! Two of her college friends will be spending a few days at our place soon and plan to explore Seattle while they’re here! Betty Crocker Mug Treats – You may not be able to send cake but you can send a simple microwavable treat! Mugs – They gotta have a mug to cook their treat in! 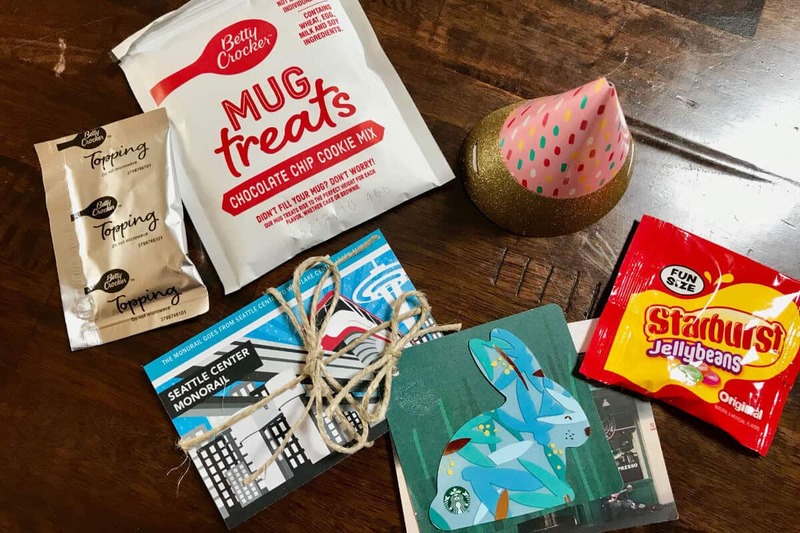 Your recipient may already have a few mugs laying around but why not send a new one, just for fun? 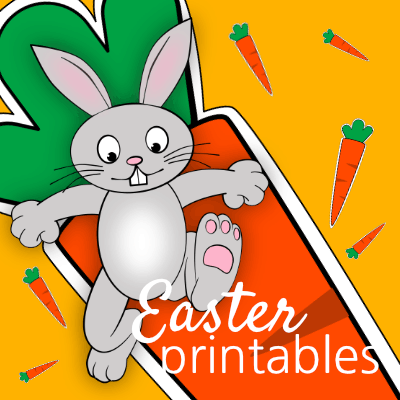 Party Napkins – Make their day festive with fun party napkins! Mini Party Hats – Okay, I have to admit, the kids never really wanted to wear party hats at Birthday Parties but what says Birthday more than a party hat? Our goal here is to exude Birthday Party as loud as we can! 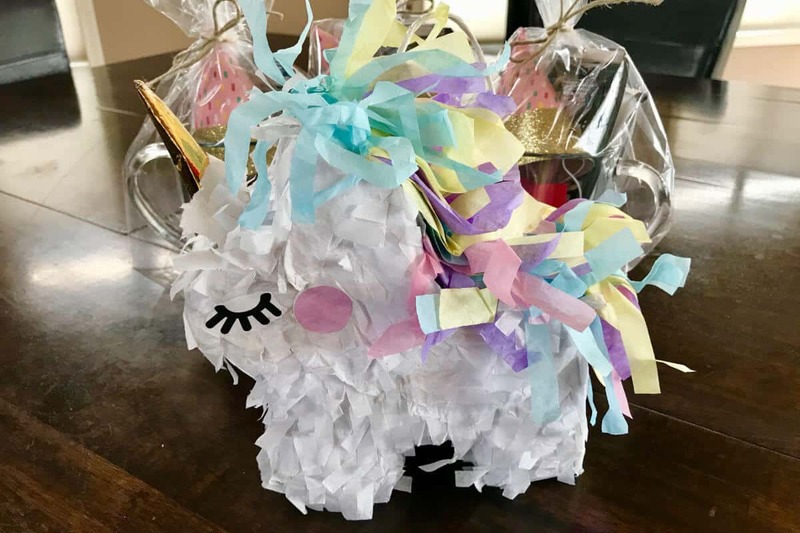 Miniature Piñata – Yes, I realize they are probably too old for the traditional piñata but this miniature piñata is so stinkin’ cute and perfect to share with friends! Candy – You gotta put candy in that piñata! 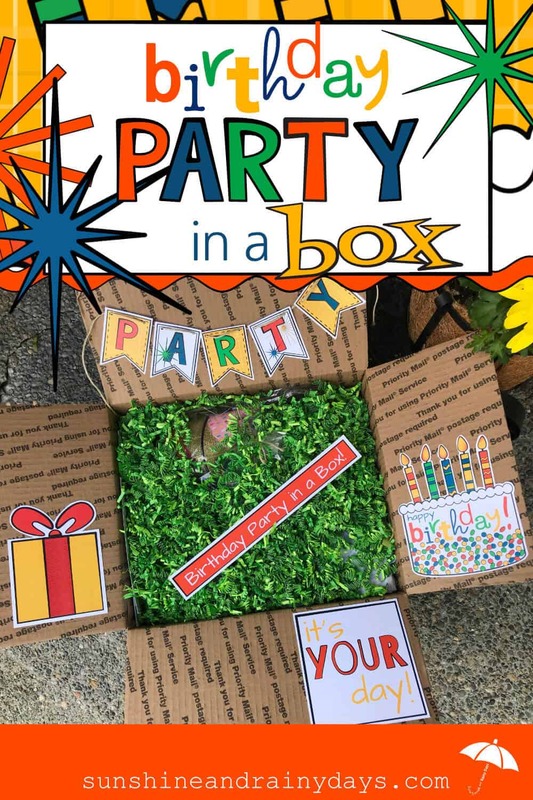 Party Favors – This Birthday Party In A Box is meant to be shared with friends! Don’t forget the party favors! 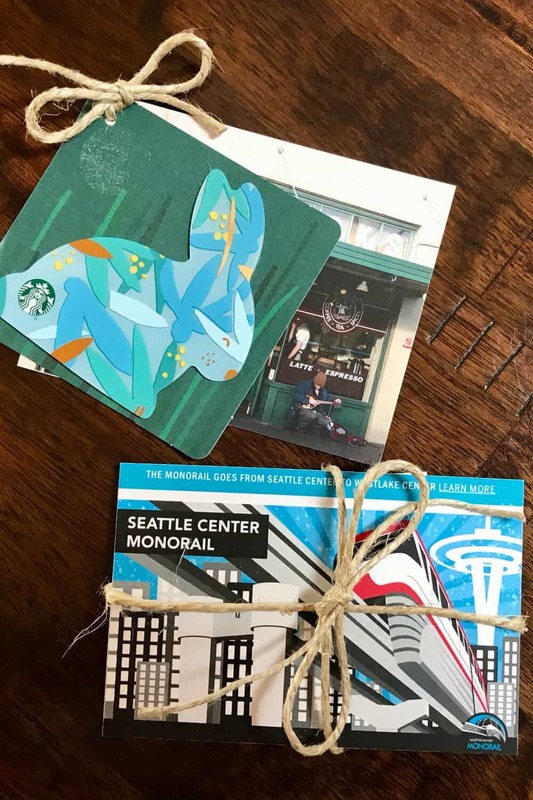 Since two of my daughter’s friends plan to visit and explore Seattle soon, I sent a few party favors that they can use in Seattle! 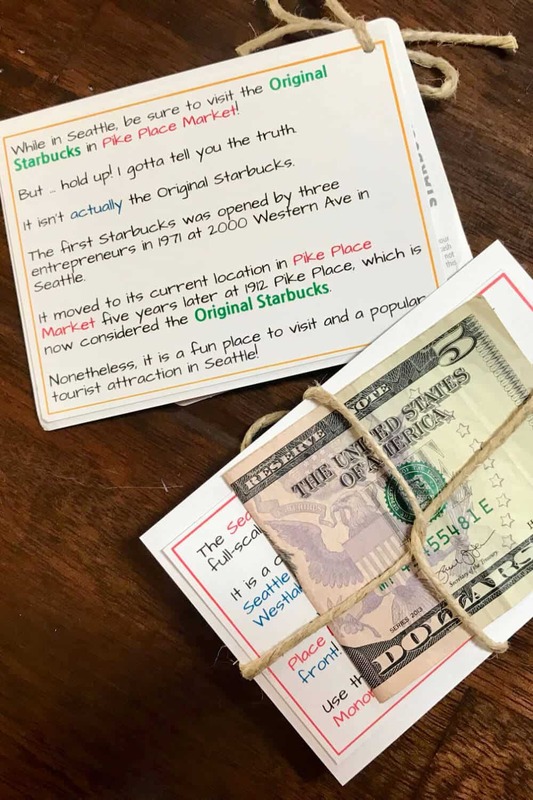 Starbucks Gift Card – to use at the Original Starbucks. Round trip Monorail fee – because they certainly will want to experience the Monorail! I typed up a little information about each and adhered them to the back of a picture of the Original Starbucks and the Monorail. Then, I placed these two gifts, along with a Mug Treat and Party Hat, in a glass mug! Birthday Card – Make it personal with a Birthday Card! iTunes Gift Card – An iTunes Gift Card will give them the chance to download some new tunes and Let The Music Play … can you say DANCE PARTY? Mom Tip: I find it super easy to order exactly what I need from Target online to pick up in store! There’s no need to hunt for the items you want. Let Target do the hunting for you! Even though I can’t spend the day with my Birthday Girl, I’m glad I was able to send a little fun on her special day!